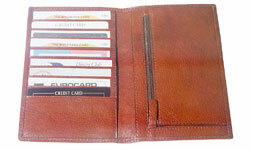 This wallet in cow stone wash finish leather is a beautiful brown. The grain pattern is natural; the touch is soft and smooth. On opening, there is a note compartment and two side pockets. The RHS has a zip pocket for coins. The left has a flap with a net window for the driving license. Behind the flap is another window for keeping photographs of loved ones. There are 9 credit card slots on the LHS with two slots on the side. 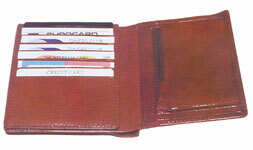 It is also available in other types of leathers in our range of colours. 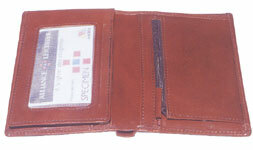 A cow vegetable dark tan leather wallet. This leather is tanned with environmentally friendly chemicals. On both sides are two side pockets and the RHS has a zip pocket for coins and the LHS has 9 credit card slots. There is note compartment from the top. A sleek small wallet in black cow polished leather. There is one note compartment. The RHS has a zip pocket for coins. 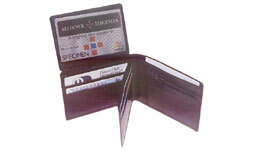 On the LHS are two flaps opening from the side and top with two credit card slots and behind each is a net window. 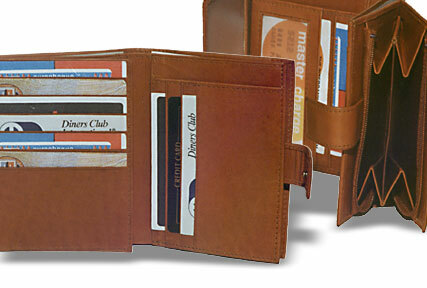 Beneath the flap are a side pocket and two credit card slots. This note case is made in Oil Pull Up. On the outside is a zip pocket for coins with a partition of size 9 x 12.5cm. On releasing the press button a full wallet opens up. 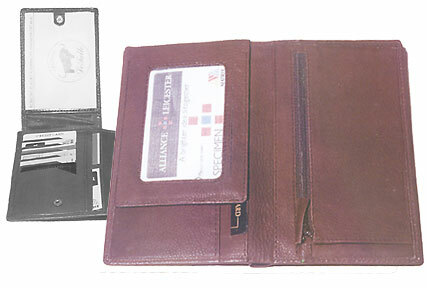 This has two note compartments, 12 credit card slots, two side pockets, two deep pockets of size 12.5 x 8.5 cm, a plastic window for the driving license.